The large community of athletes at TASIS owes a huge thank you to Athletic Director Sonny Lim for all he does to make athletics special at TASIS, including putting together videos like the one above. A big thank you is also due to School Photographer Kim Nelson for pouring so much time and energy into TASIS athletics and for capturing so many great photos and video clips. Mr. Lim closed the Fall Sports Banquet on November 14 by thanking all the players for their tremendous dedication this season and made sure they joined him in thanking their coaches. "Without these selfless, wholehearted people here before you, this could not happen," he said. "Your coaches are probably the most dedicated people you'll find on this Earth. They do this out of their passion for the sport and out of their passion for wanting to share life lessons with you, and they truly are magnificent human beings." Please enjoy photo galleries from the fall season and game recaps from tournaments and individual contests, and we offer a quick look at each team's season below. These players should be proud of what they have accomplished, proud for not giving up when they were down, and proud for learning how to play as a team. The Varsity Boys Volleyball team exceeded all expectations this season, compiling an impressive 14–2 record and emerging as champions in three of the four major tournaments. 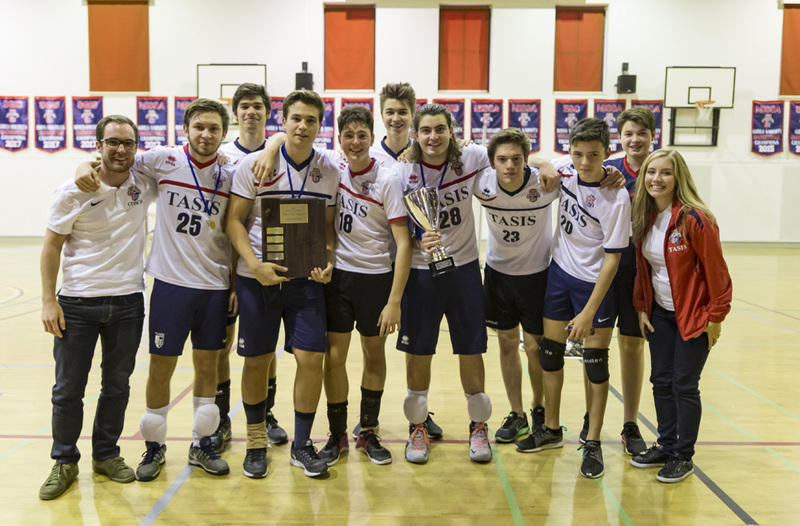 The team was a perfect 3–0 at the International Schools Sports League (ISSL) Tournament at TASIS in September, 4–0 at the European Sports Conference (ESC) Tournament at TASIS in early November, and 3–0 at the Northern International School Sports Association (NISSA) Tournament in Milan in late November. The Tigers' lone losses of the season came at the Swiss Group of International Schools (SGIS) Tournament in Basel in late October. 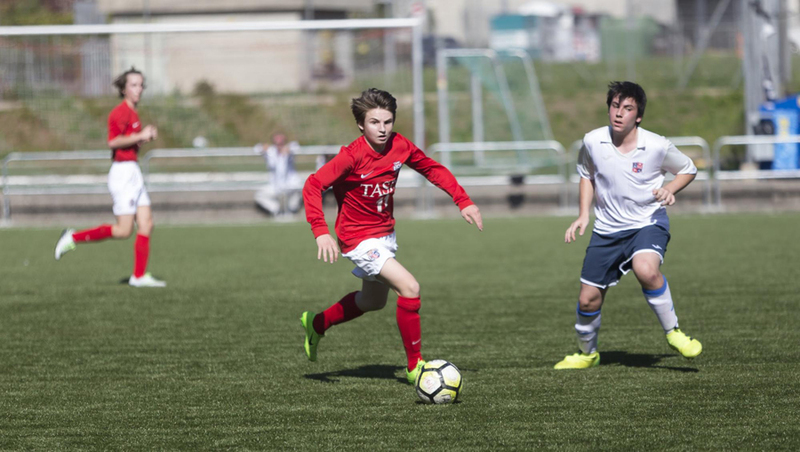 The ESC Tournament was particularly memorable, as the TASIS community came together to host five teams hailing from Italy, Germany, Portugal, and Switzerland. The Tigers overcame a 25–13 loss to a powerful International School of Lausanne squad in game one of their opening match to win their next eight games and capture the championship trophy in front of a large and raucous home crowd. The ESC title was the team's fourth in five years, and Nick Barbieri '18, Can Basaran '18, and Nadir Timerbaev '19 earned selections to the 12-member ESC Tournament All-Star Team. We will miss our three seniors—Ari, Charlie, and Xiana—but we still have a young team coming back, and hopefully we can keep it up next year. 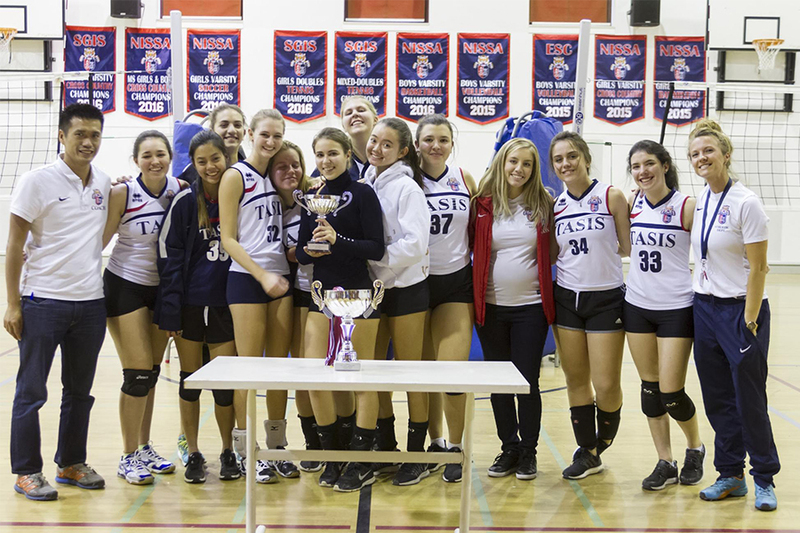 The youthful Varsity Girls Volleyball team won all four of its friendly matches, placed third at the ZIS Invitational in Zurich in early September, swept all six of its games to win the ISSL Tournament in Zug in late September, took fifth at the ESC Tournament in Geneva in November, and finished second at the NISSA Tournament at TASIS on November 19 en route to an outstanding season record of 15–5. Arina Kolesnikova '18 was named to All-Star Team at the ESC Tournament. Virginia Italia '19 chronicled the team's championship run at the ISSL Tournament in this great video. Coach Masa Yo was very pleased with the turnout for Girls Volleyball this year, and the large group of underclassmen in particular allowed the program to field a competitive Junior Varsity team. 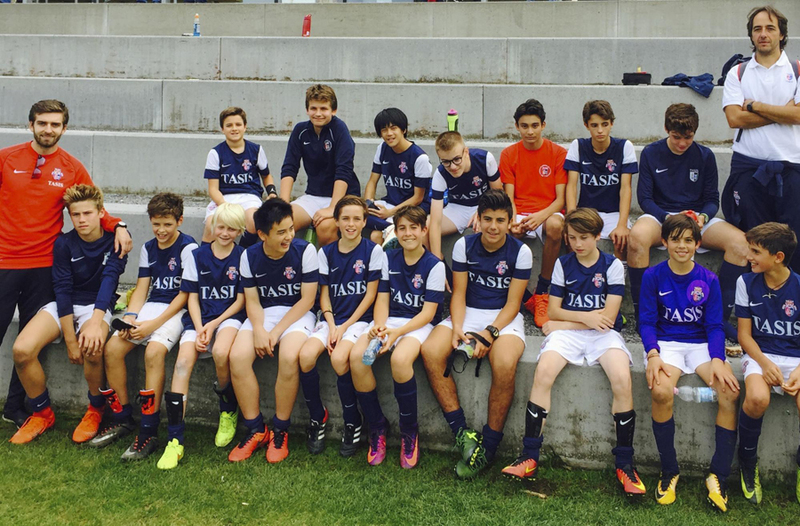 The young Tigers fought their way to a runner-up finish at the ISSL Tournament in late September and would later defeat both American School of Milan and International School of Como in friendly matches on their way to a solid 6–5 season mark. The future looks bright for Coach Yo's program, as three of the Junior Varsity team's five losses were to Varsity teams, and the Tigers remained competitive in all three matches. Mr. Lim's tireless efforts make it possible to play four tournaments in three different countries in less than three months. His work on the SGIS Tournament alone is remarkable. Coach Matt Walker's team swept its home-and-home series with American School of Milan, winning 2-0 in Milan in September behind goals from Daisy Bachofen '20 and Lucia Ugolotti '20) and 1-0 (goal from Airi Barnes '19) in Lugano during Family Weekend. Goalkeeper Yulia Mochalnikova '19 recorded both shutouts. The Tigers shut out three of five opponents and beat defending champions St. Julian's School 1-0 in their final match at the ESC Championships in Lisbon, Portugal, in late October, and captain and center defender Eve Ryan '19 was named to the tournament's All-Star Team. Emma Dressler '18 wrote an excellent recap of the three-day trip. Both Daisy Bachofen and Autumn Bachofen '21 were named to the All-Star Team for the SGIS Tournament, which TASIS hosted in Tenero in early November, and the girls closed the season by winning three of four games (all shutouts) to finish second at the NISSA Championship in Milan. I've had the privilege of watching you boys grow together, fail together, and get up and support each other again and again. I am proud that you have dedicated your time to maintain and support each other and most of all lift each other up even when you were above your limits. Coach Alex Zanecchia's very young Varsity Boys Soccer team (just one senior on the roster) worked hard and supported one another until the end. 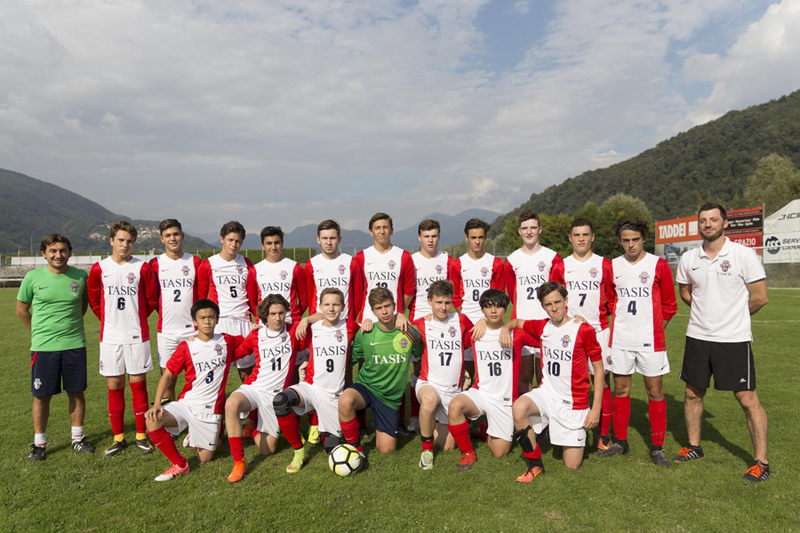 The Tigers overcame early-season struggles to post some impressive victories in major tournaments down the stretch, including a shorthanded 3–1 win over International School Basel in early November at the SGIS Championships, where Filippo Cipolini '19 was named to the Tournament All-Star Team. One week later, the team fought bravely against a very strong field at the ESC Tournament in Carcavelos, Portugal, and the week following that, the Tigers erupted for nine goals in their opening match against British School of Milan in the season-closing NISSA Tournament in Milan. They went on to finish that tournament with a hard-fought 0-0 tie with St. Louis School, providing plenty of optimism for next season. These players have improved their knowledge of the game, their technical skills, and the way they think about the game. With so many of the program's underclassmen pressed into duty for the young Varsity team, the Junior Varsity Boys Soccer team knew it would be facing an uphill battle this season. As Coach Tom Angelitti noted at the Fall Sports Banquet, the team understood going into the season that victories would not be easy to come by. The Tigers did, however, meet their primary goals of working hard, improving as players, remaining competitive, and having fun, and they are optimistic that the program is moving in the right direction. "We had a very successful season of teamwork, support, and camaraderie. The season started with a group of young soccer players from grades 6, 7, and 8 with a range in abilities from never-kicked-a-ball to near expert. Nonetheless, the girls instantly connected and set the tone for a very rewarding year. During practices, we emphasized skill progression through drills, set plays, and friendly intrasquad matches. This practice prepared us for our one tournament at Zurich International School, where we won, lost, and tied our three matches. 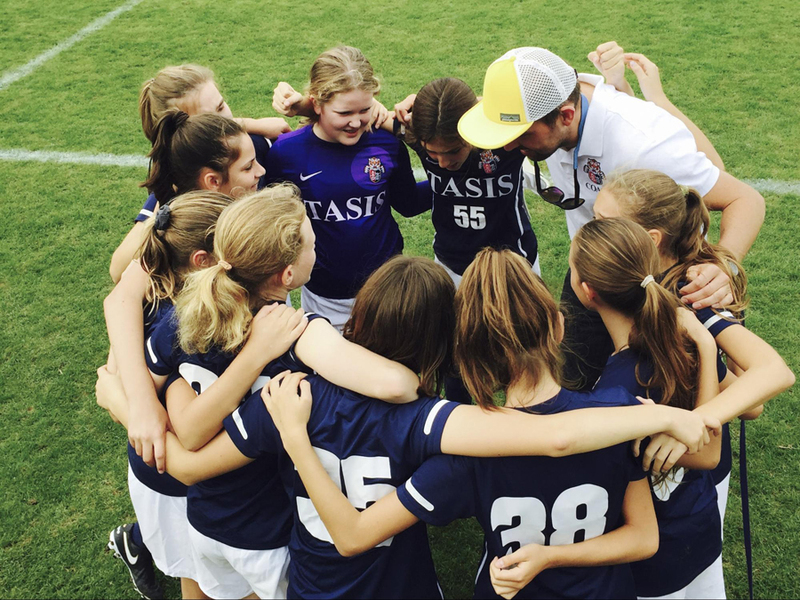 Throughout the tournament, our girls represented TASIS with hard work, support, and kindness to all. Overall, the girls grew not only as players this year, but also as friends, teammates, and supports for their peers." "The Middle School Boys Soccer team has shown great development over the past two years. It has been a pleasure for Coach De Gregorio and me to work with the many returners from last year. It is great to see the boys transition and mature, both mentally and physically, in the sport of soccer. This year, many new additions, both boarders and day students, added strength and depth to the team. The boy's performance in Zurich at the ISSL Tournament in Zurich showed us their persistent trait to never give up—which we admire. We are confident that if the boys persist with their passion and grit, they will succeed in anything they put their minds to." 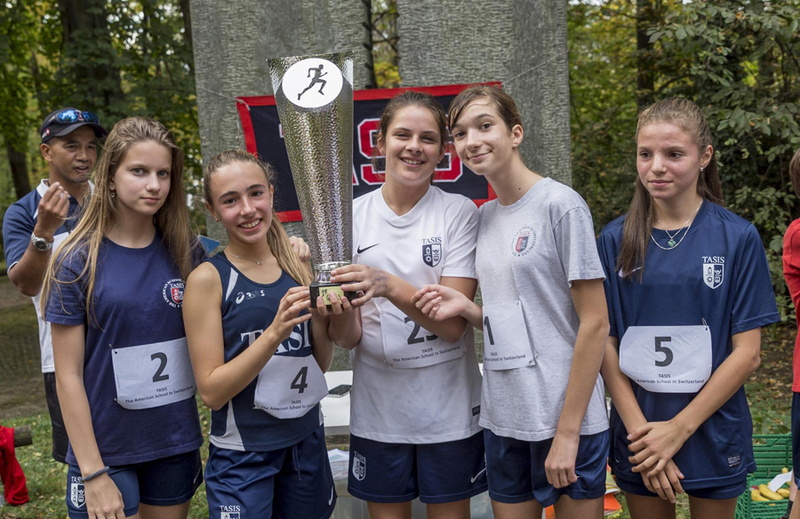 Led by a second-place overall finish from Raffaela Barros '19, the Varsity Girls Cross Country team defeated a tough field of opponents from ZIS, ICSZ, and ISG to take first place in the season-opening ISSL Championships on the TASIS Grotto Course on September 23. The Varsity Boys team finished second as Harrison Reed '19 and Denis Breus '20 anchored the team, finishing second and fourth, respectively. The girls also fought hard to defend their title at the SGIS Championships in Zurich in late September but had to settle for a runners-up finish behind a loaded ZIS team. Barros and Emma Dressler '18 finished fifth and seventh overall, respectively, and both Breus and Reed placed in the top ten in the boys race. Ten TASIS runners took advantage of ideal racing conditions to post ten season-best individual times and capture both team titles at the TASIS Cross Country Invitational in late October. Barros won her first individual championship of the season with a time of 22:15 over the 4.9-km TASIS Grotto Course while Lyla Thompson '20 and Katie Kelly '19 also raced to podium finishes, earning the 2nd and 3rd place individual medals with times of 24:43 and 25:15. Reed was the top finisher for the boys at 19:45, good for third place overall. The Middle School Girls Cross Country team finished first while the boys took second at the NISSA Championships, which TASIS hosted on October 17. Ivan Linnikov '22 and Romolo Cerra '23 finished second and third overall in the boys field, and both Sophie Ogilvie '22 (4th) and Angelica Graf '22 (5th) placed in the top five for the girls. Linnikov, who also made contributions to the High School's Varsity Boys Volleyball team this fall, closed out a fine season by besting the field and establishing a new course record at the TASIS Middle School Invitational Cross Country Race, which was held on the TASIS Grotto Course on October 21. Max Lim '24 also finished the season on a high note, taking third in the grade six race to reach the podium for the first time. The team finished in second place overall. 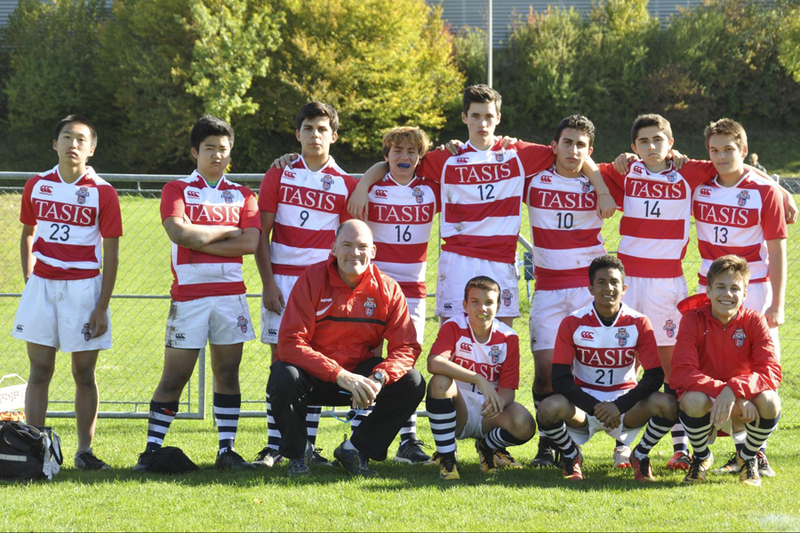 After being downgraded to a recreational sporting activity last year due to insufficient players, it was always going to be touch and go at the beginning of the 2017–2018 season for the TASIS Varsity Boys Rugby Team. Kazu Nakanishi '20, the only surviving player from the previous season and eventual captain for this season, played a key role in generating interest and recruited a number of new players from his grade 10 Hadsall Dormitory. The new team showed a lot of enthusiasm despite most of the players having never touched or ever seen a rugby ball before. The first game for the team was a friendly at Muzzano Stadium in Lugano against Lyceum Alpinum Zuoz, and the boys produced a spirited display against a much older opposition for what was the first rugby game at TASIS in more than 10 years. This introduction was invaluable experience for the team in preparation for their first tournament at the ISSL 7s Tournament at Zurich International School. But the reality of being a new team was evident in the tournament as TASIS came in last in 6th place. They did, however, receive an ovation for their courage and determination by the hosts at the beginning of the award ceremony. With a focus on rucking, tackling, and team communication, the Tigers came back home and worked hard for their final tournament of the season—the SGIS Rugby 7s Tournament at Le Rosey—and were rewarded with a 4th-place finish out of seven teams, an excellent end to the season.